Many folks have written stating that they are confused about using our Amazon link to support my efforts here on the blog. Part of the problem is that some browsers do not show the logo links. As far as I know, all of the browsers show the logo links on the right side of each blog page. To help us out, simply click on the long skinny Amazon link that appears in the right-hand column of each blog page. Then begin your search. As long as you make all of your purchases in a single session, all will be successfully tracked to BAA. And all with be greatly appreciated. Folks in Canada can use this link: Amazon Canada to start their searches. You can simplify things by saving the page as a favorite and then opening it each time that you shop. After 6 straight days with more than 2500 page views, yesterday’s post, Simplicity, Undoing the BLUEs, and More…, garnered only 2171 such views. It was a great post; if you missed it, or if you ever photograph snow on a cloudy day, you can see it “Simplicity, Undoing the BLUEs, and More…” here. This post marks 107 straight days with a new educational blog post. With so many folks getting in the habit of using our B&H and Amazon links why quit now? To show your appreciation for my efforts here, we do ask that you use our B&H and Amazon affiliate links for all of your B&H and Amazon purchases. Please check the availability of all photographic accessories in the BIRDS AS ART Online Store. We sell only what I use and depend on. We will not sell you junk. We know what you need to make creating great images easy and fun. And we are always glad to answer your gear questions via e-mail. This blog post took more than 4 hours to prepare. Enjoy. And learn. 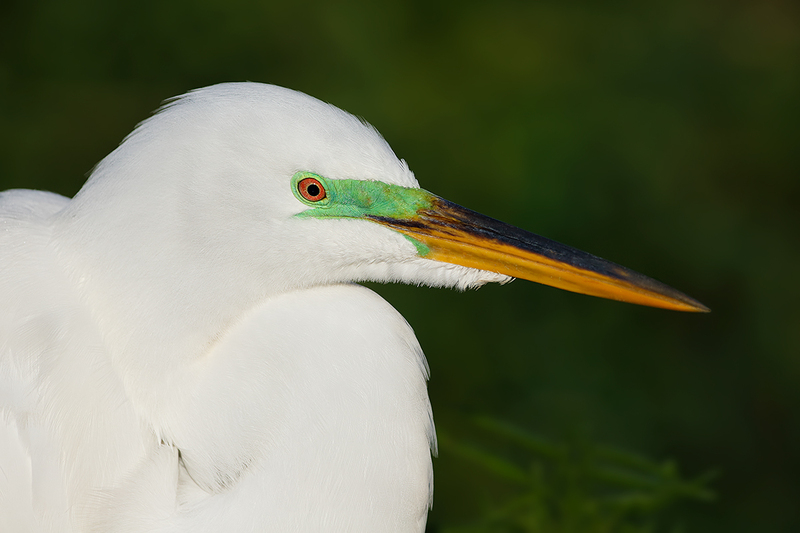 This image was created yesterday morning at Gatorland with the Canon EF 200-400mm f/4L IS USM Lens with Internal 1.4x Extender (hand held with the internal extender in place at 560mm) and the Canon EOS-1D X. ISO 400. Evaluative metering -1/3 stop framed: 1/1200 sec. at f/6.8 in Manual mode. AWB. Two sensors to the left and two sensors above the central Sensor/AI Servo-Surround/Rear Focus AF squarely on the green lores as framed active at the moment of exposure. Click here to see the latest version of the Rear Focus Tutorial. Click on the image to see a larger version. 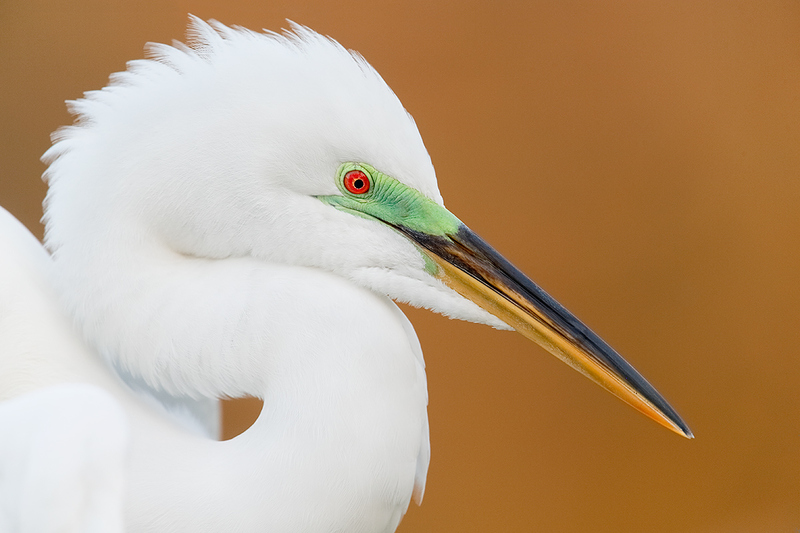 There were lots of tame gorgeous Great Egrets in full breeding plumage yesterday for the Short Notice In-the-Field Workshop at Gatorland. Once I had the image above lined up, I noted an ugly out-of-focus white flower in the background just above the bird’s head. So I scrambled back to the gazebo, grabbed my sturdy milk crate, and created the image above. Note that since I was hand holding it was mandatory to have AF active at the moment of exposure to prevent throwing off the focus due to my moving ever so slightly. This image was created with the Gitzo 3532 LS carbon fiber tripod, the Mongoose M3.6 head, the Canon EF 600mm f/4L IS II USM lens, the Canon 1.4x EF Extender III (Teleconverter), and the Canon EOS-1D X. ISO 400. Evaluative metering +1 1/3 stops as framed: 1/400 sec. at f/5.6 in Manual mode. Color temperature: AWB..
Three sensors to the right and two sensors above the central sensor/AI Servo Surround/Rear Focus AF just below the bird’s eye (see the BreezeBrowser screen capture below) active at the moment of exposure. Click here to see the latest version of the Rear Focus Tutorial. Click on the image to see a larger version. Notice the exposure compensations in the first two images. In image one with the sun out at 8:30am the meter was pretty smart. With the subject in the shade for the second image I needed to add a good amount of light to come up with a histogram that showed data 1/2 way into the rightmost box…. I repeat, with the sun out at full strength evaluative or matrix metering will be pretty smart. In shade, with cloudy or overcast conditions, and early or late on clear days, it is much dumber; the lighter the overall tonality of the image the dumber it gets. The other day we saw that a snowy hillside in pre-dawn light needed almot +4 stops EC….. Note: Nikon folks would have needed at least -2/3 stop for Image #1 in order to avoid significant blinkies. Feel free to critique one or more of today’s images. Let us know what you like and what you don’t like. Let us know how you think an image might have been improved. Honest critiques done gently as we do on BirdPhotographer’s.Net are preferred. Please also let us know your favorite image of the 3. This image was created with the Gitzo 3532 LS carbon fiber tripod, the Mongoose M3.6 head, the Canon EF 600mm f/4L IS II USM lens, the Canon 1.4x EF Extender III (Teleconverter), and the Canon EOS-1D X. ISO 800. Evaluative metering +1 stop as framed: 1/200 sec. at f/5.6 in Manual mode. Color temperature: AWB..
Two sensors to the left and two sensors above the central sensor/AI Servo Surround/Rear Focus AF active at the moment of exposure. Click here to see the latest version of the Rear Focus Tutorial. Click on the image to see a larger version. Subject in shade, background in sun. I just love that situation. Here the background was made up of distant, dead palm fronds across the gator moat. You will need to add varying amounts of light to come up with the correct exposure in these situations should you be lucky enough to encounter them. As always, aim to get at least some data 1/2 way into the rightmost histogram box, the fifth box on Canon cameras, the fourth box on Nikon bodies. 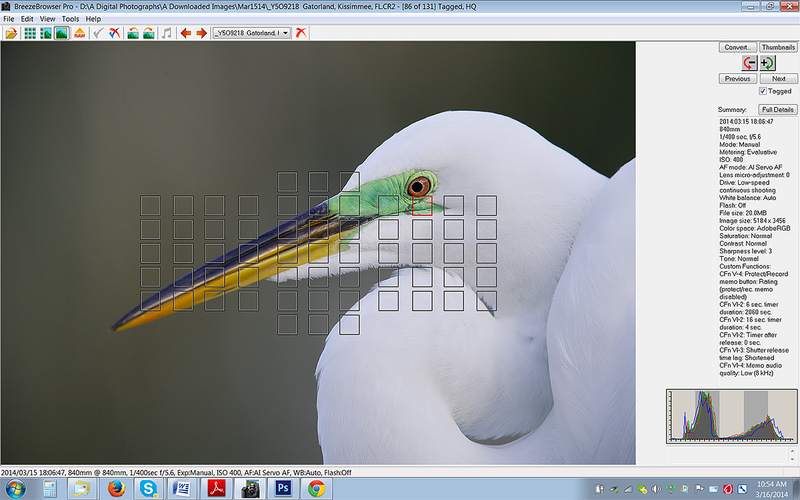 Above is the BreezeBrowser Main View screen capture for Image #2. Note that the illuminated red square just below the bird’s eye depicts the AF sensor that was active at the moment of exposure. Note: in Breezebrowser you need to check “Show Focus Points” under View to activate this feature. To see the focus points in DPP check “AF Point” under View or hit Alt L. Hit Alt M to see Highlight Alert. To learn how and why I use DPP (Canon Digital Photo Professional) to convert my RAW files, see the info on our DPP RAW Conversion Guide here. Note the histogram with data well into the fifth box. Note that I like to bring my WHITEs into Photoshop with RGB values no greater than 130 or 235. Whether hand holding (Image #1) or working on a tripod (Images #2 & 3) I have been making more of an effort recently to choose a sensor on or near the subject’s eye to ensure razor sharpness on the face and eye. Little bit of a typo. It should have said “that’s the definition ..”, meaning that if the observer’s eyes are drawn in this case to that gap, then they are in fact being a little distracted. You would likely rather their attention be directed straight to the rest of the bird and its face in particular. It’s really minor in this case. I was just trying to make the point that any compositional element has the potential for being a distraction from the primary subject, and should be evaluated accordingly. I think why I like this background so well is that it not only is not a distraction (because it’s so well blurred), but its colors actually complement the colors in the bird. All good! 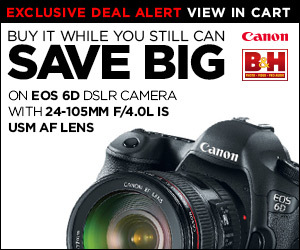 Thanks for the daily blog, I have purchased items, including a camera from B&H using your link. Will do the same for Amazon. Hi Jeffrey. Thanks for stopping by. Recently I have been mentioning the lighting conditions for various images. As I did here for all three images…. I will try to remember to do so more often. In nearly all cases, however, you can tell if the sun was out by looking at the images; #1 here was obviously lit by full sun, #s2 & 3 were obviously in done in shaded or cloudy conditions. If you see lots of plus EC, you know that it was not sunny. YAW, and many thanks for using my affiliate links. Love the background on the third image. Love the red eyes! Tanks Lady D. Me too :). The link to yesterday’s undoing the blue’s post doesn’t work, which could be why some didn’t see it. I read this everyday and don’t remember seeing that one. On AOL, the Amazon link is not on the right, it is near the bottom. On the bottom right or the bottom bottom? Thanks artie. 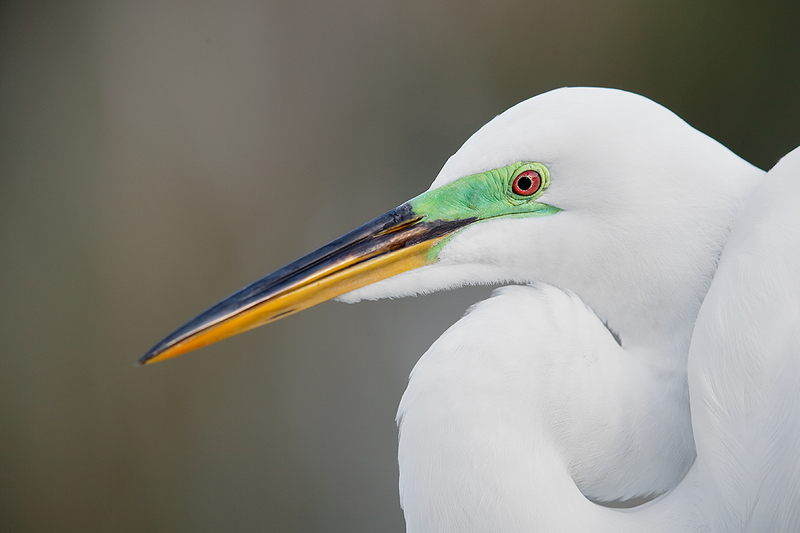 I like the space showing between the body and neck, I like that the beak is all in focus, as apposed to the other two. and I love the background colour!! Yes, I noticed the space between the body and neck .. right away. But that the definition of a distraction. But I do like the colors, sharpness, and rest of this composition. Great job.